If you’re trying to manage a heavy debt load, you’re not alone. According to a Northwestern Study, Americans owe an average of $37,0001 and many are understandably overwhelmed. Large credit card and loan balances take a big bite out of your available income, causing stress and chipping away at your financial security. Debt can also negatively impact your credit score. While building up a credit history is critical to boosting your score, having a surplus of loans and credit cards can make it tough to pay bills on time—and making timely payments is a primary factor in determining your credit score. A high debt load and high credit utilization ratio can also knock points off your score. In this post, we’ll cover the best ways to pay off debt, raise your credit score, and enjoy more financial freedom. There’s no silver bullet or magic program that will help you pay off debt at lightning speed. The key to paying debt down as quickly as possible is devising a solid plan and sticking to it. That includes examining the habits that got you in trouble to begin with—and making sure you break the cycle. That said, if you follow these steps and keep future overspending at bay, you’ll see results much faster than if you continue without a plan. Here’s our step-by-step guide to paying off debt as quickly as possible. 1. Examine what you owe. Start by reviewing all your debts, from credit card balances and student loans to unpaid medical bills. For each item, record the amount owed, interest rate, and minimum payment. Knowing what you owe will help you choose the right debt payoff strategy for your situation (more on that in a minute). Since increasing your credit score is also the goal, you’ll want to get familiar with your credit report. Check your score, scan for inaccuracies, and formally dispute any mistakes by sending a letter to the credit reporting agency (here’s a handy template you can use). 2. Analyze your income and obligations. Take stock of your monthly income and expenses, and determine how much you can contribute toward paying off debt. Online personal finance tools and calculators can be helpful here. As you’re crunching the numbers, commit to acquiring no new debt. Your budget should not rely on credit cards. Next, look for ways to add extra cash to your debt payments. Could you cut back on eating out, freeze your gym membership or start a side hustle? Some short-term pain can provide some very big gains by helping you aggressively tackle your debt. 3. Decide on a strategy. This involves rolling several debts into a single new loan. By taking out a new loan with more beneficial terms than your current debts (including other loans and credit cards), you can save on interest and/or shorten the payoff period. Once you have the lump sum from the new loan, you can pay off your other existing balances in full, so your total debt load does not increase. Then, you’ll make one single monthly payment on the new loan. Unsecured personal loans are a common way to consolidate debt. Personal loans typically have a fixed interest rate and a fixed payoff period (maturity), and are available from a variety of sources, including banks, credit unions and online lenders. Borrowers with higher credit scores are generally eligible for loans with lower interest rates. Some people find it attractive to consolidate credit card debt using a personal loan. For one thing, they may be able to lower the aggregate interest rate—credit cards don’t typically offer attractive rates after the low intro rate period—and save money on interest. Another benefit is that you have a fixed payoff date, which lets you know when you’ll be done with debt, which can be a motivating factor. This strategy focuses on paying off your highest interest rate debts first. You’ll make the minimum payment on all debts except the one with the highest interest rate—for that one, you’ll pay the minimum plus the extra amount you’ve designated in your budget. Once that balance is eliminated, you’ll move to the next-highest interest rate debt. 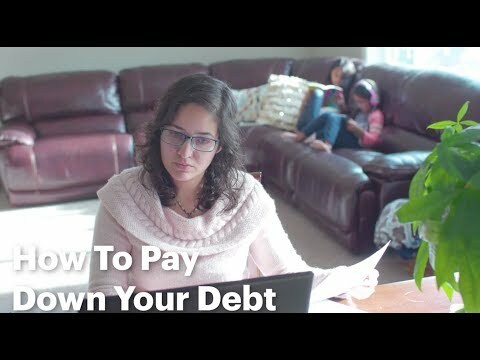 Like the snowball method (more on that method in a moment), you’ll have more money available to pay the second debt now that you’ve eliminated the first debt’s minimum payment. With the avalanche method, you’ll save on total interest costs compared to the snowball method. There will be less immediate gratification, however, especially if your highest-interest loan is your largest balance. A debt payoff calculator can provide encouragement as you watch a debt-free future draw closer each month. This approach focuses on paying off your debts in order from smallest to largest balance. You’ll make minimum payments on all your balances except the smallest—for that one, you’ll pay as much as you can. When it has been fully paid off, turn your attention to the next-smallest balance. Your budget determines you can pay $400 each month toward your debts—that’s $280 in minimums, plus an additional $120. With the snowball plan, you’ll tackle the dental bill first, paying the $40 minimum plus the additional $120 each month until it’s paid off. Next, you’ll tackle the credit card. Now that the dental bill has been eliminated, your monthly minimums equal just $240, so you can contribute an extra $160 to the credit card balance ($400 minus $240). Fans of the snowball method like the momentum gained from the psychological satisfaction of successfully eliminating debts. Plus, by the time you reach your highest-balance debt, you’ll have the largest amount of funds to contribute directly to it—another morale booster. Keep in mind that you may end up paying more in interest with this method compared to the avalanche method, for example. You can also consider a credit card balance transfer. Some credit card issuers allow you to open a new card and transfer over your other credit card balances (other types of debt aren’t typically eligible for transfer). During a promotional period—usually one year—the interest rate on the entire balance will often be quite low, sometimes even 0%. If you can afford to pay off your full balance during the promotional period, you could save a substantial amount in interest and quickly pay off your debt. Keep in mind, though, transfer fees usually apply and you generally need a high credit score to qualify for the low promotional rate. Some borrowers also choose to get help from credit counselors, who offer support with budgeting and debt management. It’s important, however, to choose a reputable credit counseling agency and be aware that not all services are free. 4. Execute the plan and prepare for the future. As you begin to eliminate your balances, experts recommend keeping your paid-off credit cards open—even if you’re not using them. Leaving them open with a $0 balance will improve your credit utilization ratio and boost your credit score, paving the way for a brighter financial future. One possible exception: if your card has an annual fee you may want to close it once it’s paid off. Finally, it’s so important to identify the habits that led to your unmanageable debt load in the first place. If you’re taking the time to make a plan, pay down debt and boost your credit score, the last thing you want is to continue doing the things that can unwind all your hard work. Interested in using a personal loan as part of your debt consolidation strategy? Our application is quick and easy. You’ll get a decision in seconds—and checking your rate won’t affect your credit score.